Woo hoo! I'm so excited! 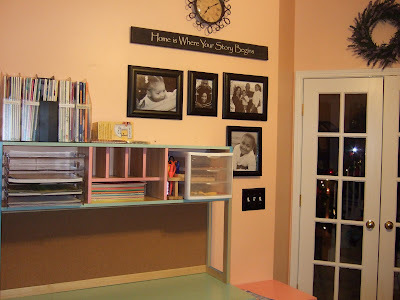 For the last four years, I've used every room in our house to indulge my scrapbooking passion. I've longed to have a space that was just mine, one where I could leave stuff out and sit down to continue when time permits. I've made mess after mess on the dining room table, the coffee table, the floor of our bedroom, the basement, the bar -- you get the point. Honestly, I can't complain. My family has been more than patient, and did have a dedicated armoire in the front living room, although its main purpose was for storage and left no room to actually work. 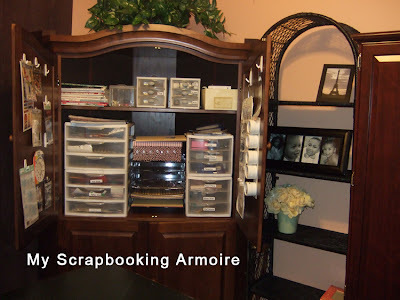 If you're not familiar with the craft of scrapbooking, it takes up a lot of space . . . and any die-hard crafter (whether she's into stamping, cropping, knitting, etc.) has got a TON of crap. 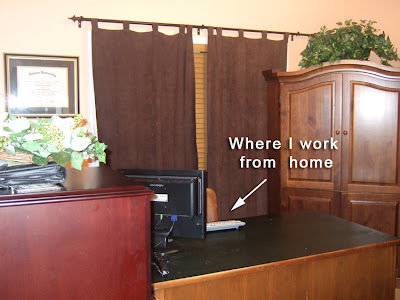 So you need room to store and when you work, you need room to spread out. For the last few months, I've had my eye on a few craft workstations, namley one from Scrapncube.com, but they averaged well over $1700! I'd even considering asking Tony to build me one . . which would be awesome and 100% custom-made, but he's just recently finished the basement and the bar and deserves a much-needed break from carpentry. So while making our traditional Goodwill run after a delicious lunch at Slopes, I found an ultimate steal! Except for the fact that the 7-piece set was painted in pastel colors (which I'll soon be changing to off-white), and that I only wanted 4 of the 7 pieces, it had all the components I was looking for. Unfortunately, they wouldn't sell them separately. But no worries . . . I've got two little girls that would kill to have those ugly little side and corner tables in their rooms. Win-win! Or so I thought. When I got home, I realized that the tables didn't fit into the space where I'd envisioned they would go -- a little nook in the basement. They were exactly one inch too big. But then Tony suggested that we just convert the office into "my space." How sweet was that? 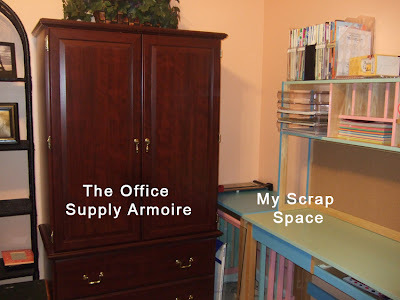 So we moved my scrapbooking armoire into the office, slid over the one we use for office supplies, removed the reading chair (that no one uses for reading), and everything fit perfectly. I am esctatic! I've got my printers, the computer, my storage and my work space all in the same room!!! It's not fully stocked and organized yet, but I've got a 4 day weekend coming up, so I'll have something to keep me busy. Check it out! Love the room! 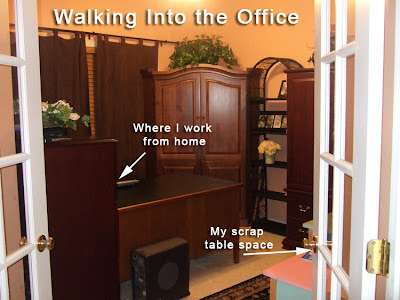 You lucky girl, I've just started working on my scrap/office room. I look forward to seeing the finished product. Thanks for the inspiration.